Highly anticipated full length from London act Slipslide, featuring the songwriting and vocal skills of Graeme Elston (The Love Parade, Pure, Eva Luna, Astronaut). Entitled "The World Can Wait" the album is the first release since the band's celebrated "Sleeptalk" single 18 months ago. Since then, Elston and fellow Astronaut members Dave Masterman (drums) and Brychan Todd (bass) have been joined by new member Matthew Hawes on guitar and vocals. Contrasting nicely with nine heartfelt compositions from the Elston songbook are two songs by Matthew ("Back to Work" and "Halfway Over Town") that feature a wry lyrical humour and his splendid smokey croon. The album boasts numerous examples of classic songwriting within the three minute pop formula, with the signature 12-string guitars, keyboards, melodies, and addictive choruses found on Slipslide's two previous singles for Matinée. This is refined guitar pop worthy of a place in your collection next to beloved classics from Aztec Camera, Orange Juice, The Colourfield and Go-Betweens. 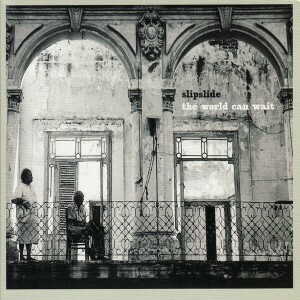 Not only was Monday my birthday but it was also the official release date for Slipslide's debut album "The World Can Wait" on Matinée. The main man in Slipslide is Graeme Elston, who I have known since he was 17 and in a band called The Very Dabs, who I thought were the bees knees the first time I saw them playing live at the Broken Doll in Newcastle back in 1989, Total Pop Experience! He's since gone through a host of band names ....the Love Parade, Pure and Eva Luna, releasing pearl after pearl after pearl. Wouldn't it be nice if some label did a compilation of all those bands releases, so we can have them all in one place? At last he's managed to record a full l.p. of songs, which I've been waiting god knows how long for, it was certainly worth the wait though, if only for the last track "the world can wait" which apparently nearly didn't make it onto the record, imagine if that had had happened, we would have been deprived of possibly his best song yet, a great combination of The Orchids, Sugargliders and Edwyn Collins all at their very best. Listen to it, sing along to it and fall for it, just like I do everytime it's on. Soundtrack to my summer. --This Almighty Pop!